Copyright (c) – Multiverse Ltd.
Phonographic Copyright (p) – Multiverse Ltd. Mastered at Scape Mastering studio Berlin. Tracks 1, 6, 11 & 19: published by Socan. CD packing: Jewel case + 8-page booklet. I want to report that is circulating on Discogs sealed versions on CD-r of Deadbeat - Radio Rothko. Be careful and ask before you buy this cd. As the other comments have stated, this is an exceptional dub-tech mix by one of the biggest names in the genre. 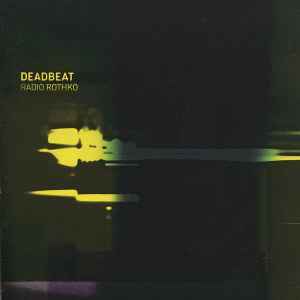 Deadbeat touches on all of the key players, including more than a few from the innovative Basic Channel/Chain Reaction camp, and current favourites like DeepChord and Intrusion. I like the inclusion of 2562's "Redux," too, because it provides a nice rhythmic break, and is an example of how dub-tech can influence dubstep with great results. My only complaint is that there's hardly any come-down at the end of the mix; it slowly builds, peaks, eases off a bit, then peaks again with "Reverberation" and "Deep Structure" right at the end. With about 10:00 of space left on the disc I would have preferred a slower finish, but honestly, that's a small quibble when dealing with a mix as well-executed as this. Absolutely essential for any fan of dub-tech and deep, minimal techno. The mix-flow is extremely good. Excellent track programming, feeling very natural. Keeps me moving from beginning till end; no annoying moments. Dub pace like it should. Will make me smile at every spin. :-)) Thanks Deadbeat! After nearly 5 years of listening to this I must admit, this mix is close to perfection. And by saying that I really mean perfection. And hey, this is basically a dubtech only mix on CD. You heard many of them? This makes it even more badass. One of the most-often-listened-to cds in my collection. Dub tech from all sides of view, dub-zen at its finest. This CD is inspiration. P.S. Please check out the extended and deep essay by Philip Sherbourne in a booklet. It's another reason to buy this CD. Thank you Philip and thank you Scott. Pure pleasure! I love this Remix album! This is one of the best records I've bought in the past year, or more. Just marvelous. Run, don't walk. This is some serious dub-tech groovy funk that makes your mind-body link. Excellent mix! What I really like is that the mix never leaves the dub-tech genre. Usually DJ's shift to techno or (worse even) dubstep. A great selection of artists, avoiding the obvious picks. Personal highlight: M06A vs Reverberation... Wow!